In the Newton and Palm days, I had a rather popular software solution for helping automate my Task List creation. The discussion came up recently that the world of iOS/Android users could have their lives made easier by a new version of the old app. The first attack was to simply rewrite the software using more modern interfaces and current work flows. While this would be a very usable answer to many people’s life challenges, it isn’t the direction everyone is going with repeatable steps. Now, apps are attempting to watch and understand how a person works then automatically presents completed information instead of asking for users to plan or type. So, do I rethink the app with magic automation or keep people in charge? To help with the answer, I turned to watching people do task management. Also, I started paying more attention to how the current interactive apps impacted my life. Normally, I would keep an eye on the default calendar app, finding the smart interactive apps interesting but didn’t risk missing a meeting on them guessing things right. Standing in the rain with the dog, the clouds got it wrong since SkyMotion said it wont be raining for two hours. I let the app know through the provided interface that the clouds didn’t get the memo and dropping water now. An hour later, drinking my coffee and looking outside at the rain, SkyMotion still says it wont rain for another hour. Osito’s Red lettered alert pops up on the screen, my meeting is in a half hour and my drive to the office is now showing 25 minutes long due to traffic. Great info, but since I’m already at the office, I just walk down the hall to the meeting room and hang out for the half hour I’m early. Directions and timing of my morning drive to work is also highlighted by Google Now. Which, rather than going straight through the vineyards two lane highway for 20 minutes, would very much rather I went on the four lane highway South for 15 minutes then turn North West for another 15 minutes. A month ago, I found on Google’s Web site that there is no way provided to tell Now the path I prefer but it will learn over time. EasilyDo has it right with; it’s raining outside, I’m at the office, I have a friend with a birthday coming up, a package has shipped from my ebay purchase and a coworker has a stressful post about his mom isn’t well. Uh… well, all the data is right, UI isn’t great, but I guess I can’t say EasilyDo got anything ‘wrong’. The shipping window goes to the shipper but there is no info, let’s blame that on the email or shipping company. Siri, loves my wife’s voice, thinks I’m talking jibberish (apologies to the people of Jibberish). Gets the words wrong, wont open a requested app… I’ll go load iOS7 beta and see if that voice personal assistant is a better listener. Voice entry is cool, but with the shrinking desk space and less Work-From-Home time available, talking out loud is heard by everyone around. Funny times when right in a the middle of a meeting someone asks Siri out loud what a word is the boss just used in a arm waving lecture. The smart auto complete of Tempo reminds me of the built-in capabilities of the Newton OS. While I replaced the Newton OS handwriting entry was quickly with Graffiti, the quick meeting creation was a hit for me every time. Tempo outlines similar features in their demo… just enter a name and a type of meeting, the app knows who I’m talking about and where we will be meeting. “Brian @ movie” got me a meeting for the current time with that same text. “Afternoon movie with Brian” gave me a meeting for the current time showing the 9 different “Brian” in my Contacts invited… no way to select which. And… it continued when I put in the theater, the movie… Hey, I’m late to get to the movie! Finally, top-of-mind is FourSquare. I have mentioned before that the service has gone away from the gamification angle. Instead of going to the app and checking in, then seeing where friends where checking in. Now, I can check in and maybe receive a discount (not much good if I check in after I order) as well I can search for things around where I am that have been reviewed. Interesting, since the app knows it is 11:30 and I have not checked in for lunch… and the service knows where I have gone to lunch off and on for the last year, I would think it would pop up with a recommendation. “Hey, I see you like Pizza, you have not ate lunch today and you have not had pizza for a couple days so here is a Pizza place within walking distance to where you are”. Without smart interaction like that, why wouldn’t I just go to Google Maps on my handheld and look up local places than add to FourSquare’s database? It would appear that smart assistant is what everyone is buying into, but I am not seeing a lot of actual users relying on any one solution yet. So, no roadmap forward based on other solution successes. Rather than second guessing task creation, the initial re-release of the app will have auto complete based on history and the task timing can be calculated as well. Giving a bit more time for the continued development of databases that assumptions can be based on. Assumptions? Well, I’m sure someone will call it intelligent forecasted suggestions based on user history and best practices. 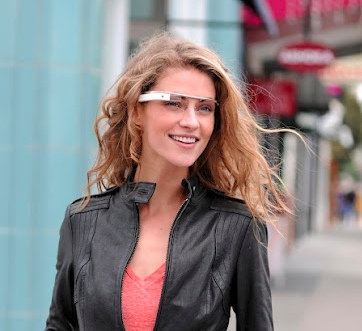 The term ‘Google Glass‘ actually refers to the Glass Project Google announced recently. 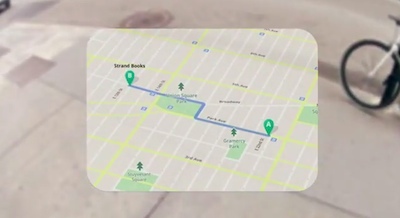 The ‘Glass’ or ‘Glasses’ as they actually are, is a method to use Augmented Reality data without having to walk around holding your smartphone up in the air and pointing it’s camera at things. Instead, the data is presented to the wearer like a fighter jet heads up display, numbers and information floating over the area you are viewing. If you look at a store front and there is information available for the location like name, address, contact information, hours and other bits. A movie theater might even have a list of movies showing, the user tips their head a bit to scroll through the list and sees show times. If you have not seen the Project Glass eye wear, they are not a pair of two eye glasses. There is a single bar on the right side of a person’s head and a nose bit to hold everything in place. The right eye area has what looks to others as a prism just above the center of the wearer’s eyeball. The demo Google did at the Developer’s conference was a few folks jumping out of an airplane with the glasses on. While jumping out of a perfectly good plane was very exciting, it isn’t something many of us do so the power of Project Glass was lost, who can relate? The current users of heads up display glasses and augmented reality today is folks doing specialized wiring where they are able to see information on the loom they are looking at and what should be there to test/repair. The ‘glasses’ look more like very large goggles so they aren’t realistic to walk outside of a controlled environment with. Non ‘glasses’ wearers are holding their smartphones up in the air as they walk around town, hoping they stumble upon some bit of information about the things they are looking at so they feel rewarded for everyone staring at them. With all of the power of Google that can brought to a person wearing the new device, the data isn’t the issue. It is the delivery of the data. A person sitting at a desk with a nice big Internet pipe is only handy when dealing with people that are at the office all of the time. Then, there is a the walking person, they are moving slow enough that data can get to them without the users noticing that they slowed their pace a bit for the data to arrive. The walker can change their mind in the direction they are heading which will be forecasted to the system when they hesitate where they shouldn’t be along the projected path. Any system smart enough to be making decision on what information is important to that walker will also be watching for alerts coming in through their data feed, like key words in an email or text message that would cause a person to alter their original plan. Enter the bike mounted messenger/delivery person. The rider needs to receive mapping information very quickly as a bike has a speed multiplier over walking. While a bike will weave it’s way through a traffic jam, a packed road can slow the ability to make money. As the course has to change a block at a time, the data must update, all while cutting around tall buildings. A delivery person being paid per drop can’t wait to finish a job to get the next. Incoming pick up jobs and locations need to appear as they happen, the rider will decide on which jobs they take while not slowing to take their hands off the handle bars. Between the work there has to be the social and personal aspects of a person’s life, email and social site updates. Data communications should be both directions. Progress, location, confirmation of pick up and delivery. No need to carry a scanner when an image of the package or package ID will have a Google Goggles record so a office can search and find/reference later. All of features are available on Android based devices now. The test is being able to interact with the environment, fast enough to keep a bike on schedule. Lets not forget to throw in a sign scan glanced at, then reported on later when options for the evening are being explored. Augmented Reality – Construction, Inspection and Sales – Let’s get moving! Sitting on the highway this morning, not moving, I passed the time between emails and watching a construction team move a lot of dirt. The hard hatted individuals consisted of one gent running a large shovel machine, two people standing on the hill looking down and two workers aligning survey equipment. Watching the process, I wondered why the shovel operator wasn’t looking through a heads up device that was telling him where to dig and how much was left to be completed. Construction: Workers on a building or residence construction team could come in each day and receive their updates electronically. They have a checklist of work to be done and, looking through a single eye lens could see a overlay of what is there now compared to what they need to do. Exact locations of wall structures, outlets, wiring etc. All of this data is directly out of the design software used to create the building drawings with a human or software dividing up the timeline/progress to give to the team each morning. Selling the dream: Need a bit of empty warehouse for this one. Load up a clients floor plan in their little carry unit hooked to their video glasses and let them loose to walk from room to room in their new location. The can walk through augmented reality walls and into a real wall or trip so some cautions should be used. Otherwise though, they can see if there is enough room to turn around in the kitchen or too far to go from the master bedroom to the kids room. For condos on upper floors, real view images could be put in so a person can see the view their dollars are buying and if they can see any of it from the other side of the dinning room. This is actually not a difficult bit of technology to do and is much better than even computer screen 3D walk through. 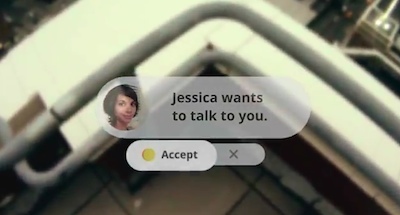 There are several ways augmented reality software knows what to show a person. Popular for games is a paper with a box or ID image which the app uses to build the 3D view around. For more advanced systems, location is assigned via global positioning for low precision due to several feet difference is acceptable. For a construction site, beacons would need to be used that have their altitude and location to each other set. Then, personal devices within the area would key off those to know what the user should see with pretty good precision. A house would need two beacons while larger construction like the highway dirt diggers might need three to six beacons to not get into underground gas and power lines. Who’s in? Let’s get started! What are all these wooden ‘book’ shelves used for? We are not far off from needing a new name for those wooden shelves in offices at work and home. There may be some classic books or ‘coffee table’ books that will need a home. But, the shelves are quickly becoming not needed for Instruction/Tech Manuals, Novels and even most Magazines. Currently, there isn’t a perfect single electronic solution to carry and provide access to all of the needed reading materials. Most manuals are text only so they work nicely on the Kindle. It is easy to search for key words, move rapidly through pages and can even read (audio) most electronic ‘Kindle’ books to you. Black and white images are fine but color and even most gray scale images do not do well on the Kindle. For color image ‘books’, I turn to PDFs and ePub electronic books, viewed through either my iPad’s iBooks or GoodReader apps. There can be some limitations for getting through the book quickly, but generally search is supported. Color diagrams and charts are usable in these formats. Lastly is my magazine subscriptions. My wife has magazines she buys that she sells later while most of mine are for research or just for fun. Very few electronic magazines are less expensive than their print counterparts. For me, they are much easier to carry and read on-the-go in the electronic form. My iPad is with me everywhere at the office and most times around the house so I have several years worth of Wired, Photo Pro, Dwell, MacUser, Macworld and StuffUK. Great to have in hand when on my exercise bike every night. The purpose of this article isn’t to convince you to sell your print books and go all electronic. Instead, it’s a statement that it works for me and my crystal ball says that there are types of books in your life that will actually be more usable if you had it as an ‘eBook’. They aren’t perfect for all books for all people, yet. Electronic versions are easier to carry in bulk and most carry more ‘features’ than you can have on paper. Wired has multimedia built into their electronic versions (US version is very nice… not sure why the European version has lost their way with weird scrolling mini boxes). Providers like O’Reilly offer very large selections of manuals and instructional eBooks to get me through my work day. Searching a eBook is much easier than trying to remember what page I had read content on later. And the Kindle books play through my headphones as I put my PowerPoints together. How many times do you change your mind about buying something around how you can pay for it? How easy is it to buy things in a store compared to online? Do you feel safe handing over your credit card information? Does paying options tie into your gift buying decisions? I’m going to skip the stories and the ‘how I got here’ discussion today. This post is straight to how things have to change. Amazon is doing record numbers of Kindle and Kindle book sales. Many of my friends jumped onto the Kindle wagon and those that have not can view Kindle books on their iPads and desktop computers. With eBooks becoming so popular, it means that Amazon now makes money on every reader of that book. Gone are the days of reading a book and then handing it onto others to enjoy. The writing is on the wall that the price of Kindle eBooks will be slowly rising up to the level of print books. If that is the case, can I get a discount on a book I want to ‘share’/buy for someone else? At least down to the eBook pricing of today. Of course, that would mean that I could buy a eBook for someone else and ‘send’ it to them. I hadn’t noticed till I tried to buy a book for my sister in-law that there was no way to give her info so the purchased book appeared on her Kindle. I guess I wont be giving books as gifts anymore since my friends use Kindles and wouldn’t want a print book but I have no way of buying a book for them outside of a dollar amount gift certificate. Since I’m in the mood for buying. You may remember my earlier post about the yesteryear days of PayPal on the Palm. I could beam money to a store cash register via IR rather than handing over cash. The problem, the store had to buy IR ports, just a couple bucks, but they never did it. Now, the iPhone PayPal app includes ‘Bump’ technology. Will I soon be able to Bump my iPhone to a cash register at the store to pay? While a cash register doesn’t move much, they aren’t connected up to the Internet… generally. So, there is no geo location associated to know the payment send and receive are next to each other. Again, the best solution will be an add on item, much like the card swipe. To make me feel better that the transaction is for the one time and is only for what I wanted to pay for, the store’s device should give me a number that I put into my PayPal ‘Bump’ app. An extra step from just bumping the two, and many folks buying beer at the Gas Station wont care. For those making a 50 dollar purchase at the local grocery store or a couple hundred at the local clothier, they will take the extra effort for peace of mind. No more paper receipts floating around the store, no more credit card magnetic strip getting copied. When I think of rolling out a system like this around the world it seems like a huge task. But then, think back when someone said we could have a personal transportation device, all we needed was fuel distribution facilities on every corner.